John Willard (16? 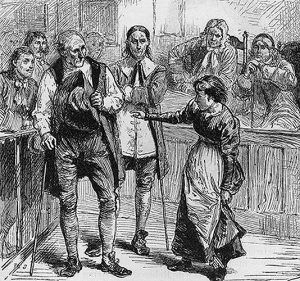 ?-1692) – Though there were numerous heroes among the hysteria of the Salem witchcraft trials, John Willard would become one of the first to speak out against the madness, which would end up costing him his life. Little is known of John’s early life, but he grew up in Lancaster before making his way to Groton, Massachusetts. There is some evidence that he may have been related to Major Simon Willard, one of the most prominent Massachusetts land speculators, town founders, and politicians of the time. Major Willard was known to have had a business in Lancaster, had founded the town of Groton, and John Willard was associated, in his land dealings in both communities, with Simon Willard’s sons. However, this relationship to Simon Willard has never, as yet, been confirmed. John married Margaret Wilkins of Salem Village in the 1680’s and the couple was thought to have first lived in Groten. However, they were soon in Salem Village and would eventually have three children. Margaret was a third-generation member of the large Wilkins family who was very tight-knit and extremely wary of outsiders. As such, John Willard was not a welcome member of the clan. Headed by patriarch, Bray Wilkins, the family included Bray’s seven children and numerous grandchildren who lived on and near “Will’s Hill” in the extreme western part of Salem Village. Years previous, Bray Wilkins and his sons had made a foray into what they hoped with be a profitable commercial business. Though they continued their farming operations they ventured into the logging industry. In the end, the business failed and the Wilkins nearly lost their land because of it. This caused them to be embittered against powerful and wealthy merchants in general, and when Salem Village made strides to separate from Salem Towne, the Wilkins family were second only to the Putnam family in pushing for the division. By the 1680’s, Bray and his sons had returned entirely to the role of subsistence farmers on marginal land, and though they were not impoverished, their hopes and dreams of being affluent were a distant memory. They believed that only the land itself had proven trustworthy, and the survival of Salem Village as a stable agricultural community should be the focus of the residents. The push to separate Salem Village from Salem Towne had, over the years, divided the settlement. Those who made their livings in commercial businesses prospered with their ties to the larger community, while, the farmers simply saw no need for continuing its ties to the larger city. This division of Salem Village had festered and grown so badly, that by the 1680’s neighbors were pitted against neighbors, and sometimes, families against their own. It was into this quarrelsome and bitter environment of the village and into the economically marginal family of the Wilkins, that John Willard married in to. Making matters worse, Margaret Wilkins was the first in her family to have ever married someone who was not from Salem Village. Already wary of the “outsider,” the Wilkins family’s uneasiness increased when it became known that John Willard was interested in land speculation. In March 1690, he and three partners purchased a large tract of some 400-500 acres north of Salem Village. Within just a few months, two substantial portions of the land were sold to “outsiders” at a profit for the partnership. At this point, the Wilkins family really turned against John Willard. Within no time, 12-year-old Ann Putnam, Jr. would say that the apparition of John Willard was afflicting her. She testified that he first appeared to her on April 23, 1692, grievously tormenting her. When Willard heard of the accusation, he went to Thomas Putnam, Jr’s house and denied the allegations. For several days, Ann Putnam, Jr. said no more, but would soon be claiming that the apparition of her infant sister, Sarah, who had died, was appearing to her crying out for vengeance against John Willard. Willard soon sought the council of his 81-year-old grandfather-in-law, Bray Wilkins, knowing of his friendship with the Putnams. Genuinely mystified by the intensity of feeling against him, he told the elderly Bray Wilkins that he was “greatly troubled” and asked Bray to pray with him. However, pleading a prior engagement, Wilkins put him off. Early in May, Margaret Willard’s cousin and grandson of Bray Wilkins, Daniel Wilkins became ill. The 17-year-old Daniel, who was the beau of Mercy Lewis, died of his mysterious affliction within a week. Unfortunately, a coroner’s jury found evidence that Daniel had died an unnatural death. At about the same time, the elderly patriarch of the family, Bray Wilkins, was struck by a painful and alarming urinary difficulty. Both afflictions were blamed on John Willard and the number of accusations quickly increased. Before long, Ann Carr Putnam, Sr. accused Willard of having murdered no fewer than thirteen Salem Villagers during his brief residence in the community. During the legal process, there were often several of the “afflicted girls” as well as Wilkins family members present. In fact, the finger of witchcraft was pointed at him by no fewer than ten members of the Wilkins family. “Witness” was given by Susanna Sheldon and Mary Warren, in the form of terrible fits. Ann Carr Putnam, Sr. claimed that she had seen many ghosts who told her that Willard had killed them; Mercy Lewis and Mary Walcott testified that they had seen the apparition of John Willard afflicting Daniel Wilkins, pressing and choking him until he died. Sarah Bibber would say she had seen John Willard’s specter hurt Mary Walcott and Mercy Lewis, before turning on Bibber herself. Margaret Wilkins Knight would tell the court that Willard had previously beat his wife. Samuel Wilkins testified that he had repeatedly been irritated and afflicted by something in a dark-colored coat — and that it was John Willard. John Wilkins would blame the death of his wife, after having delivered a baby, on John Willard. And, patriarch, Bray Wilkins, would say that he came down with his illness after John Willard had looked at him with an evil eye. Other “witches” who had already confessed to witchcraft, including Richard Carrier, Margaret Jacobs, and Sarah Churchwell, also accused Willard of witchcraft. With all this evidence, it comes as no surprise that John Willard was found guilty of witchcraft on August 5th. At the age of 37, he was hanged on August 19, 1692, along with John Proctor, George Burroughs, George Jacobs, Sr., and Martha Carrier. John Willard maintained his innocence until the very end. If, in fact, John Willard was guilty of beating his wife, that would certainly tarnish any “hero” status. But, his actions in refusing to arrest innocent people, speaking out against the madness, and his unwillingness to compromise his integrity to save his own life certainly makes him an honorable man in the otherwise dishonorable witch hysteria in Salem Village. 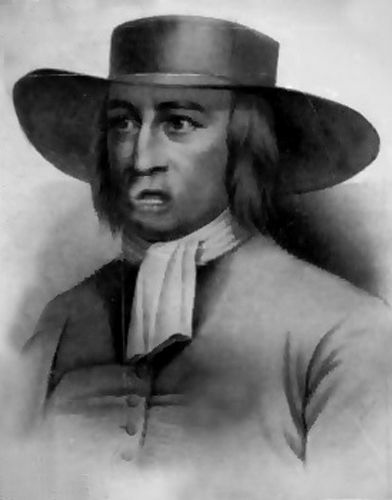 There was one member of the Wilkins family who did not join in the accusations against John Willard –Thomas Wilkins. Thomas would also later emerge as one of the four “dissenting brethren” who led the anti-Parris movement from within the church. When the elderly Bray Wilkins died, the executor of his estate was none other than the evil Thomas Putnam, Jr. Thomas Wilkins was disinherited. John’s wife, Margaret Wilkins Willard would later remarry a man named William Towne and the couple would have several children.